(Nanowerk News) The new reference-class linear stages family, L-417 and V-417, from precision nanopositioning global leader PI (Physik Instrumente), are available in ballscrew and linear motor configurations, both cost effective designs, offering high resolution with improved tracking performance, smaller tracking error, and improved settling time. Applications for both include high demands on dynamics, precision, smooth scan motion, short settling times, and low tracking error, such as laser cutting, scanning, digital printing, electronics assembly and inspection, AOI (Automatic Optical Inspection), automation, and flat panel manufacturing. The L-417 precision heavy duty ball screw model easily accommodates a load capacity of 450N on its 166m width frame with a travel up to 813mm. With a synchronous servo motor, it uses rotary and linear encoders, and can be re-lubricated without disassembly, further extending its high reliability and long lifetime. A cover strip on the side and the purge air connection prevent contamination of the working components by particles. An optional holding brake allows an increase in its usability as a Z axis stage. 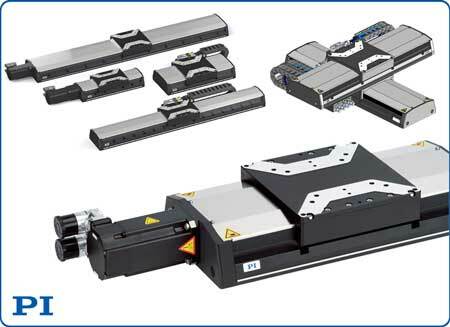 With a similar load capacity, width and travel range, the V-417 is powered by an ironless linear motor, and precision linear encoder. The 3-phase magnetic direct drive transmits a drive force of 87N to the motion platform directly, without friction. This smooth running at high and low velocities mean no vibration and easy position control. Also like its ball screw family member, the V-417 has a cover strip on the side and the purge air connection prevents contamination of the working components by particles.